The Court does not explain why it dismisses a case, but it’s a fair bet that the answer lies in part in an amicus brief authored by Professor Stephen Vladeck of American University. Professor Vladeck addressed a point that the parties had not: whether the Seventh Circuit had jurisdiction to reach the question presented. Professor Vladeck argued that the Seventh Circuit lacked that jurisdiction. Generally, an appellate court only has jurisdiction to review a “final judgment,” not many other orders a lower court may enter during a case. An exception is the “collateral order” doctrine, which allows an immediate appeal of a “a small class of collateral rulings that, although they do not end the litigation, are appropriately deemed final.” Mohawk Indus. v. Carpenter, 558 U.S. 100, 106 (2009). Courts have applied the “collateral order” doctrine in cases addressing qualified immunity, the legal concept that shields government employees from liability if their actions did not violate clearly established law. Under Mitchell v. Forsyth, 472 U.S. 511 (1985), whether an officer is immune from suit because the controlling law was not “clearly established” is immediately appealable. The courts view that issue as significantly different from the question on the merits. When a court exercises jurisdiction under the “collateral order” doctrine, however, it rarely can also exercise “pendant jurisdiction” to address other, related issues that themselves could not have been immediately appealed. 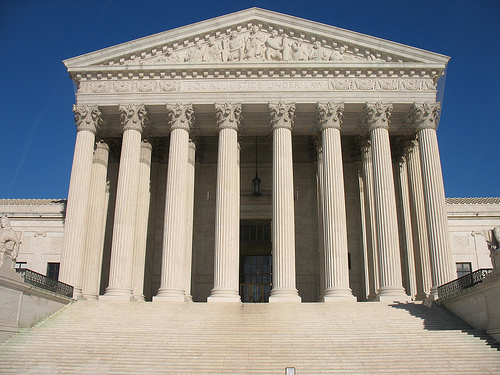 In Swint v. Chambers County Commission, 514 U.S. 35 (1995), the Supreme Court suggested that pendant jurisdiction is appropriate only when the issues are “inextricably intertwined” with or necessary to meaningfully review the defendants’ qualified immunity. Here, addressing the issue over which the Seventh Circuit clearly had “collateral order” jurisdiction, the court explained that Levin’s constitutional right was “clearly established.” But the court then added a phrase that was likely devastating to any claim of “pendant” jurisdiction here: “[w]hether or not the ADEA is the exclusive remedy for plaintiffs suffering age discrimination in employment is irrelevant.” (emphasis added) If this secondary issue — the very question before the Supreme Court — is “irrelevant” to the issue over which the Seventh Circuit had jurisdiction, it could not qualify within the narrow reach of the “pendant jurisdiction” doctrine. Therefore, Professor Vladeck argued, the Seventh Circuit lacked jurisdiction to reach the question, and the Supreme Court should decline to reach the issue first. Seven days later, the Court dismissed the case. An appellate court’s jurisdiction is not unlimited. Remember the final judgment rule, and the related “collateral order” and “pendant jurisdiction” doctrines. When opposing certiorari, be exhaustive. No one wants to face the wrath of Justice Scalia.